Amy B.H. Greenwell Ethnobotanical Garden is located within the ahupua’a, or traditional land division encompassing costal and mountain resources, of Kealakekua. Kealakekua, which mean “the path of the gods,” is a culturally and historically significant area. The coastal element of the ahupua’a encompasses a large natural harbor and it is here where Captain James Cook, the first recorded westerner in Hawai‘i, first anchored his ship Discovery and landed in the archipelago “Oowahee,” which he called the Sandwich Isles. Before the time of Captain Cook, Kealakekua was home to many high ranking ali‘i, or chiefs, of Kona. Near the shoreline one would find coconut trees and small patches of ‘uala, or sweet potato, intermittedly dispersed among the various cooking, storage, and living facilities. It was here near the seashore where majority of the craft work was done such as beating bark cloth, weaving, and carving as well ocean activities such as fishing and gathering seaweed and other marine resources. As we head mauka, or towards the mountain, from the coast we cross the lowland dry plains, known as kula lands. These lands still suffer from salt spray and very arid conditions, allowing few useful plants to grow in this zone. Typically wauke, or paper mulberry, from which Hawaiians made their bark cloth, was grown in this area, which persisted until about 500 feet elevation. Above these wauke plantations began the ‘ulu, or breadfruit, groves for which the traditional zone, kalu’ulu, derives its name. These large trees provided considerable amount of food and also provided shade and captured moisture to house other sub-canopy crops. The ‘ulu groves typically extended to about 1,000 feet elevation, at which point the rain line would allow for more intensive agriculture. The major agricultural zone, known as ‘āpa‘a, began with the rain at about 1,000 feet and extended up to about 3,000 feet. This is the zone in which Amy B.H. 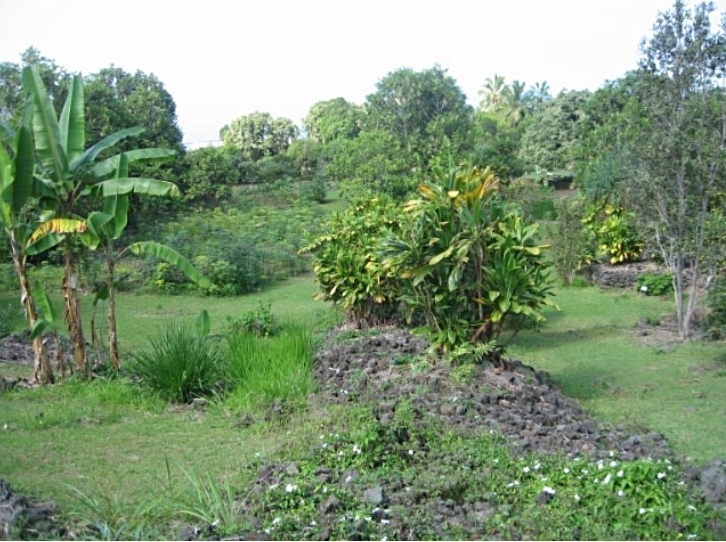 Greenwell Ethnobotanical Garden is located as well as the archeological remains known as the Kona Field System. While majority of the Hawaiian agricultural systems utilized terraces, the Kona Field Systems, possibly because this area is relatively so dry when compared to the rest of the state, developed an original system consisting of long rock walls, known as kua’iwi, that ran parallel to the slope of the mountain. In between these divisions was heavily planted with the major food crops of kalo, or taro, and ‘uala, using techniques such as mounding and mulching to conserve the scarce water as much as possible. Along the walls, which doubled as paths through the plantations, were planted other significant crops, namely kō, or sugar cane, and kī, or ti leaf. Along the upper boundary of this zone we would find less significant crops such as mai’a, or banana, and uhi, or yams. Mauka of the ‘āpa‘a zone began the wao akua, or realm of the gods. This was the dense forest that was unaltered by the Hawaiians. Several resources were collected from this area including the Hawaiian honeycreepers, collected for their feathers, and koa (Acacia koa), which was felled as lumber for canoes. Majority of our knowledge about the Kona Field Systems comes from early western explorers who extensively documented their visits. The following is one of the earliest accounts of the Kona Field System by Archibald Menzies who was a surgeon and a naturalist with Captain George Vancouver, who made three trips to Hawai‘i between 1792 and 1794.